Tebbutt: Qué pasa Rafa y Nole? City of Niagara Falls names court in memory of Bruno Agostinelli Jr. If Canada’s top tennis players were pro golfers, who would they be? Tweets of the week: Clay court tennis kicks off! Who’s the fan favourite in Indian Wells: Félix, Bianca or Denis? 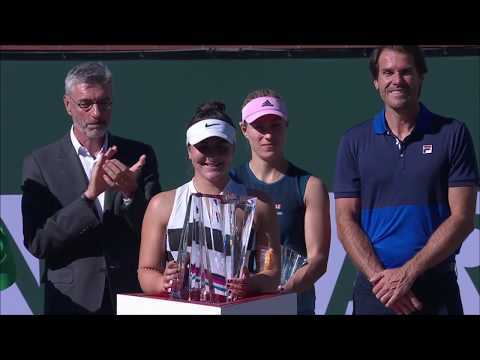 Mar 27, 2019 Who’s the fan favourite in Indian Wells: Félix, Bianca or Denis? Back injuries are very complicated. They have derailed and sometimes costs individual’s careers no matter the sport. Canadian Vasek Pospisil is attempting to return from it. Earlier in the week, the 28-year-old stepped on the court for the first time in five months after undergoing lower back surgery. The former World No. 25 still has a tough journey ahead, but there is no doubt we’ll see him soon! Bianca Andreescu, who is now a household name, continued her appearances in Toronto…. this time throwing out the first pitch in the Toronto Blues Jays game on Wednesday afternoon! We’d say she’s got a pretty good arm! Fellow Canadian stars Denis Shapovalov and Félix Auger-Aliassime took a trip down memory lane. The two players have grown up quite a bit since 2011, when this cute photo was taken. Félix was in attendance of a critical playoff push by the Montreal Canadiens on Tuesday night. During the game, the crowd gave the #NextGenATP star a standing ovation! Well deserved after what he’s done in 2019… so far! Genie Bouchard is a very busy individual to say the least, which means she has to multitask every now and then. No matter how busy the popular 25-year-old gets though, there is always room for family time. BREAKING: The US Open to add puppies to the ballperson team at the 2019 tournament for the first time. After Sloane Stephens defeated Ajla Tomljanovic to advance to the quarter-finals at the Volvo Car Open in Charleston on Wednesday. She was very… blunt on the podium when asked about the victory. How badly did @SloaneStephens want to win today? Three-time Grand Slam champ Angelique Kerber has possibly found her next career when tennis comes to an end. Kerber and ATP pro Feliciano Lopez had some fun in what we certainly consider to be content GOALS. Clay season is upon us! Current world No. 2 Simona Halep continues to be one of the most consistent forces on the WTA tour. The 27 year old is putting in the work for the new season, especially with her first defense just around the corner at Roland Garros. Finding time to travel and explore the world is always tough. It doesn’t mean we can’t live vicariously through someone! Thank you Anastasia Pavlyuchenkova for allowing us to do just that. Apr 13, 2019 If Canada’s top tennis players were pro golfers, who would they be?